* God Save The Queen. For years, Jeff Eats has been hearing absolutely amazing things about God Save The Queen! Jeff Eats and Mrs. Jeff Eats are definitely going to this one! For the First Time in Boca Raton! The Longest Running and Most Acclaimed Queen Tribute Band in the World! VIP Seating: VIP seating in the first three rows ($85). Premium Seating: Seats starting at the fourth row ($65). General Admission: Standing room only ($35). 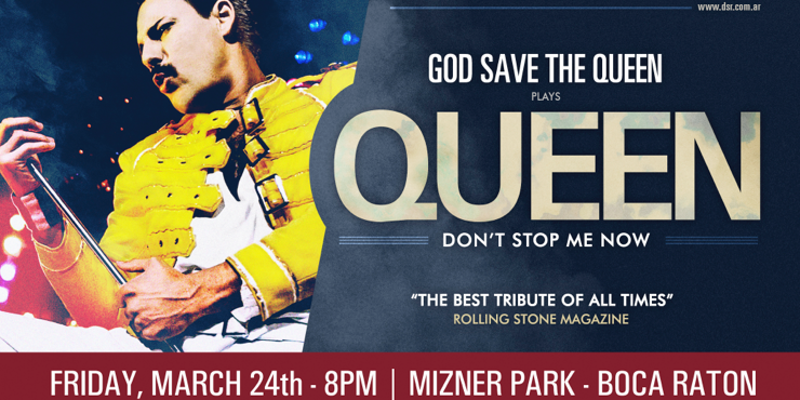 The Mizner Park Amphitheater will play host to the world’s greatest Queen tribute band when God Save The Queen takes the stage on Friday, March 24th, 8PM, to bring to life all the greatest hits from QUEEN. It’s a mythical Queen tribute show like you’ve never seen before! God Save The Queen recreates more than 20 of Queen’s greatest hits in one show! The band takes their name from the United Kingdom’s national anthem which was played on tape at the end of every Queen show while the band took their bows. For more than eighteen years God Save The Queen has been noted for their faithful imitation of Queen in fashion and sound. They perform using the precise set list, clothing, and stage antics that Queen was known for. Vocalist Pablo Padin re-enacts Freddy Mercury so realistically that along with Francisco Calgaro (guitar), Matias Albornoz (drums) and Ezequiel Tibaldo (bass).you almost feel like you are actually witnessing a legendary Queen show. This is a performance not to be missed! Just watched some of the band’s videos on You Tube and they really do put on a great show. $85 for a ticket is way too high for me, but I’m going to buy $35 tickets for me and my wife. Just checked these guys out, simply amazing. Definitely going. Thanks for the heads up. At 85 they are dreaming. Same for 65. I’m down for 35. Going to be a great concert.